The Chain scraper enz golden jet® is an apparatus which has many uses and is simple in handling and maintenance. Several different pipe diameters can be cleaned with the same tool. Layers of mineral deposits and concrete residues are efficiently removed. 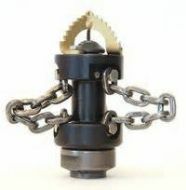 Chain flail 60 - 150 mm 3/8"
Chain Flail 60 - 150mm 1/2"
Chain flail 60 - 150 mm 3/4"
Chain flail 60 mm 1/2"